22nd September, 2016. NOIDA. Yes,The 2nd Global Literary Festival Noida-2016 began with an impressive style. The inauguration ceremony started with traditional Indian custom of lighting the lamp & garlanding the idol of Lord Ganesha. International Chamber of Media & Entertainment Industry & Asian Academy of Arts jointly organising the biggest ever Literary Festival in Noida, U.P. Sh.Sandeep Marwah ji, Jalees Sherwani ji-President-Film Writers Association, Jozef Drofenik-Ambassador of Salovenia, Alfred Vilili-Malawi High Commission, Sh.Pankaj K. Singh ji-Dy.Commissioner RBI, Sh. Buddhinath Mishra ji-Famous Poet & Writer, Sh. Sushil Bharti ji-Director-GLFN, Dr. Ajay Kumar, Sh.Narender Kumar Verma-Chairman Diamond Pocket Books, Dr. Kirti Kale-Well Known Poetess , Dr. Amit Kaur –CSR Head Apeejay Stya University, Mrs. Bushra Muzaffar-Editor of Noida Diary & many prominent literary celebrities & Social Activists graced the inaugural function on day one. After the grand success of maiden event Global Literary Festival Noida in 2015, the organizers AAFT initiated & continue it with the 2nd Global Literary Festival 2016, a three days event being held from 22nd to 24th September 2016 at Marwah Studios, informed Sushil Bharti Festival Director, GLF of said literary festival. Its yet another feather in the cap of Marwah Studio that has recently celebrated the Silver Jubilee of its foundation. 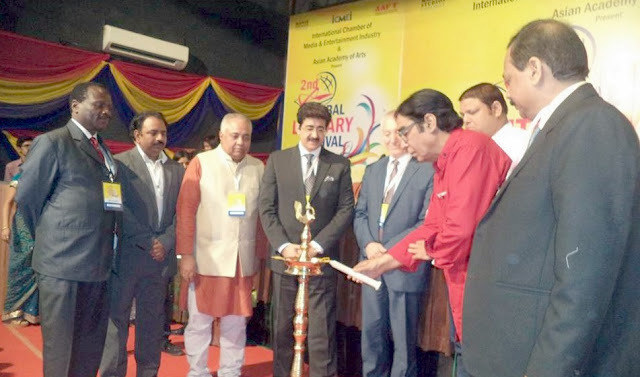 This Literary Festival has got international recognition under the able leadership of Media Guru Sandeep Marwah. Mr Marwah has been felicitated globally with many prestigious awards for his outstanding contribution to the field of Media particularly Cinema & Television industry. Asian Society of Film & Television (AAFT), in order to promote Delhi NCR in the international circuit of Cinema, also has been organizing the Global Film Festival Noida, Global Festival of Journalism & International Cell phone Cinema Festival every year. On day one of this Global Literary Festival, the Screening of Hindi literary film Satranj Ke Khiladi A film by Satyajeet Ray based on Munshi Premchand’s story & Screening of English literary Film Old man & The sea based on Writer Earnest Heminguvey were showcased. A group Art show of curator Iqbal Krishna was also inaugurated by Sherwani ji, in this art show the art work of A.K.Azad-Delhi, Ajay Shukla-Bhopal, Ajit Banks-Assam, Aana Mateiral-Delhi, Ashoo Malik-New Delhi, Christina, Dr. Jun Moni Bora-Guwahati, Ekta Jain, Iqbal Krishna, Jaleela Niaz-Singapore, Joginder Singh-Assam, Kiran Soni Gupta, Manish Pandey, Neelam Mansharamani, Pawan Lohiya, Prabuddha Ghosh, Rashmi Dayal, Sailesh Sanghvi, Sajouy Maurya-Mumbai, Tusha Rani Patowary-Guwahati & Viml Indra displayed in the art gallery of Marwah Studio. A literary seminar on “Aaj Ke Sandarbh Mein Kavita Ki Dasha Aur Disha” was also conducted in which many literary personalities like Rama Singh Gaziabad), Buddhinath Mishra ( Dehradun), Shriram Parihar (Khandava), Vinod Nigam (Hoshngabad), Sushma Chauhan (Jodhpur), Chetan Anand ( Gaziabad) shared their views. In the evening, a Kavi Sammelan was also held in which famous poet/poetess Rama Singh, Buddhinath Mishra, Shriram Parihar, Satyapal Satyam, Om Nishchhal, Vinod Nigam, Sushma Chauhan, Meena Davar’ “Mohini”, Mr Naresh Malik, Ashok kashyap, Aadil Rashid, Bhuvnesh singhal, Sarojini pritam , Namita ji recited their beautiful poems. Even a very interesting Workshop on Blog Writing and Travel Writing was also conducted by Blog Writer: Madhavi Ji , Travel writer; Kaynat Kazi & Vipin Gaur. The day first concluded with the colorful evening where AAFT students presented a fashion-show. Sitar Maestro Prateek Chaudhary & Well Known beautician Shahnaz Husain were the major attraction of the colorful evening. On day 2nd there is lot stuff for the literary lovers & Cinema enthusiasts. So don’t miss the golden opportunity & be a part of the 2nd Global Literary Festival Noida-2016.